The Agents of SHIELD Season 2 premiere is looking promising. Scratch that it is looking like it is going explode in a giant mushroom cloud of nuclear awesomeness. Why should you tune to watch the show? I will give you FIVE reasons! 1) The show promises to start off where it left off in a pretty amazing place. The synopsis is looking pretty awesome! 3) There will be awesome new agents. While the most heavily anticipated character Mockingbird will not appear in the premier other new agents will. 4) There will be a flash back sequence to the beginning of SHIELD that will feature 3 characters from Captain America: The First Avenger. Specifically, Peggy Carter, Dum Dum Dugan and Jim Morita. Maybe we will finally learn which of the Howling Commandos Agents Triplett is related too? 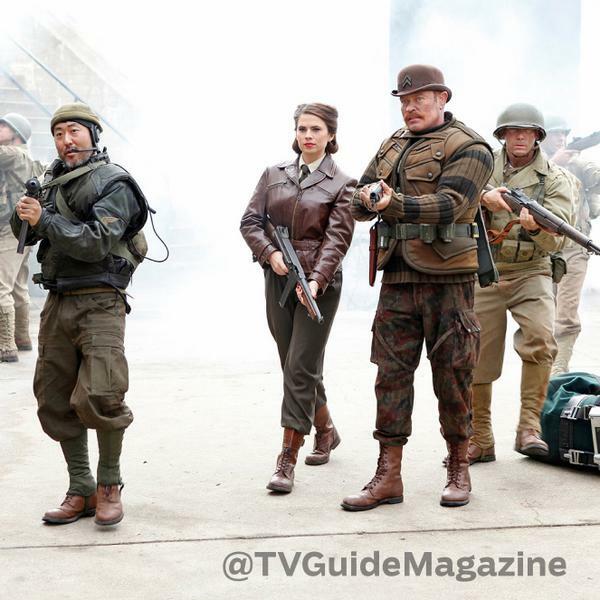 Peggy Carter, Dum Dum Dugan, and Jim Morita to appear in Premier of Season 2! Hayley Atwell is so excited for the Premiere that she is standing on her head on top of a building. 5) We may finally get some answers to some of the biggest mysteries in the Marvel Universe. What were the Circles and Lines Coulson was Drawing? Is Agent Ward really Wonderman?